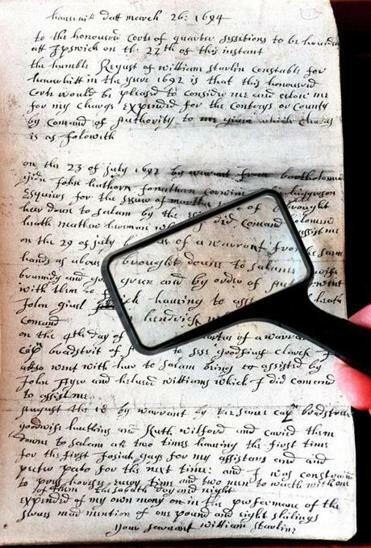 Documents from the Salem witch trials are among the records that would be housed in another community. Salem is best known for the witch trials, but it was also a vitally important seaport in the Colonial economy and the hometown of Nathaniel Hawthorne, who took early inspiration for “The Scarlet Letter’’ and “The House of the Seven Gables’’ there. Now, angry residents say, a plan by the Peabody Essex Museum threatens to cut the city’s link to its proud history. The museum is preparing to move permanently a vast collection of the city’s historical records to a facility in another town and turn portions of the buildings that housed the museum’s Phillips Library into office space for the fast- growing museum. The fate of the collection — which includes transcripts from the witch trials, Hawthorne’s papers, and records from some of Salem’s most prominent merchant families — has struck a chord in this city that once played an outsized role on the world stage, but now teems with tchotchke shops hocking crystals to tourists. At a sometimes rocky forum Thursday night, hundreds of people piled into the museum’s atrium to discuss the move, which opponents say is nothing shy of a showdown for the soul of Salem. Dan Monroe, PEM’s director and CEO, who presided over the meeting, called the notion that the city’s identity is bound up in its documentary history nonsense, and said the move is necessary to preserve the collection, which spans well beyond Salem’s history to include historical documents from Essex County and beyond. The library, which has had several incarnations with roots stretching back to at least 1799, has long served as Salem’s de facto historical society, said Donna Seger, who chairs the history department at Salem State University. The PEM has overseen the historical records since its 1992 creation with the merger of the Peabody Museum and the Essex Institute. In fact, the contents of the Phillips Library have not been in Salem for years. The museum closed the library in 2011, moving its contents to a temporary facility in Peabody (where it was open to the public) as it modernized its catalog system. The original plan, Monroe said, was to eventually return the collection to its historical home in Salem — a pair of 19th-century structures and a later 1966 addition — once they’d been fully renovated. Instead, Monroe said, the museum has decided to house the library’s contents permanently in a 100,000-plus-square-foot facility about 15 miles away in Rowley. The 1966 addition will be torn down, and the two historical buildings — Plummer Hall and Daland House — will be used for office space, while the historical reading room will remain open to the public and be used for museum functions. Although the museum mentioned that it would create the collections facility when it first announced the expansion in 2015, many in Salem said they were only made aware of the plan to move the library there late last year, when PEM representatives approached the town’s historical commission about altering the library buildings. Monroe said the museum was not trying to hide anything, noting that the library only hosts about 900 visitors each year with “very few of them from Salem.” He added that the museum did not acquire the new building for the collections center until March of last year. Friary said the museum holds its collections in the public trust and has a duty to be open about its operations.